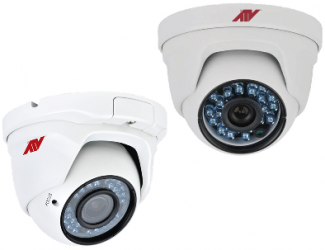 Coppell, TX – November 11, 2015 – Advanced Technology Video (ATV) a leading provider of innovative video surveillance solutions, announces the release of three new 720TVL mini-turret cameras to its Value Line Series product line. The new mini-turrets feature 720TVL Resolution, True Day/Night, Automatic Backlight Compensation, Gain Control and White Balance. The T7T212I is equipped with a 2.8 –12mm Vari-Focal Auto-Iris lens and 36 IR LEDs for night-time operation up to 90ft. Both T7T3I and T7T6I offer 23 LEDs for up to 60ft of night-time operation and are available with 3.6mm or 6mm fixed lens. In addition, all three cameras are IP66 rated and are powered through 12VDC. “We are excited to release these cost-effective mini-turrets to our line of analog products. They are designed to fit any budget and work in a wide-range of environments”, says Keith Shaver, ATV’s VP of Sales and Marketing.